The legendary Indian singer Asha Bhosle is turning 84 on September 8, 2017. To mark the momentous occasion, Zee Classic, in keeping up with its glorious of celebrating the works of the legends of Hindi cinema, is presenting an unforgettable concert called ‘Timeless Asha’ on Friday, 8th September at 7 PM in the honor of the musical queen who holds the Guinness World Record for the most recorded craftsman in music history—for recording the highest number of solos, duet and chorus-backed songs and in over 20 Indian languages since 1947. An embodiment of dedication and singing flair, Asha Bhosle is world renowned for her larger than life body of oeuvre that includes Hindi and regional film songs, popular music, ghazals, traditional Indian classical music, folk songs, qawwalis as well as Rabindra Sangeet. 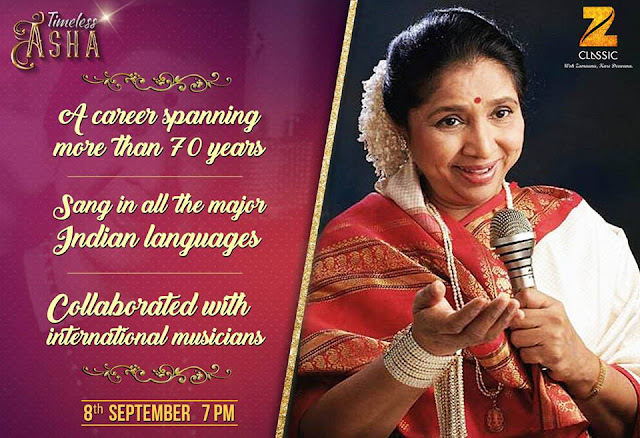 ‘Timeless Asha’, a part of Zee Classic’s brand proposition ‘Woh Zamaana Kare Deewana’, is essentially a tribute to Asha Bhosle by various young artists of the Hindi Film industry that’s graced by famous musicians, vocalists, performing artists, eminent personalities from the different walks of life including the likes Pandit Hariprasad Chaurasia, Pandit Shivkumar Sharma, Helen, Zeenat Aman, Dimple Kapadia, Moushumi Chatterjee, Leena Chandavarkar, Tabu, Bindu, Jaya Prada, Amit Kumar, Kumar Sanu, Shaan, Udit Narayan Alka Yagnik, and Rajya Sabha Member of Parliament, Mr. Sharad Pawar and his wife, Pratibha Pawar, among others. Choreographer and dancer Terrance Lewis along with actress Radhika Apte will bring out the romantic in one and all with their dazzling couple dance performance. Mujra, a unique and culturally sensuous genre, is one of the many melodic styles mastered by Ashaji, and, so on the occasion of her 84th birthday, Mahi Vij will be performing on many of her songs with all the nazakat. Making a comeback, veteran actress Urmila Matondkar will set the stage ablaze performing to a Ganesh Aarti, with dynamic dance moves and unmatched energy. Versatile singers, Monali Thakur and Antara Mitra, who have grown up listening to the legend, will pay an exclusive homage to Ashaji with a perfect mix of songs including ‘Chura Liya Hai Tumne Jo Dil Ko’, ‘Oh Mere Sona Re’, ‘Do Lafzon Ki Hai Dil Ki Kahani’, etc. Raghav, master of slow motion dance, along with Pronita, will add to the glittery evening with a mind-boggling act while the contemporary dancer Shakti Mohan will be dancing to some of the most iconic item numbers sung by Ashaji. In additional to the above, ‘Timeless Asha’ will also feature dance performances from actress Bhumi Pednekar as well as Dance India Dance stars, Vaishnavi and Manan. Also, the gorgeous and very talented Lauren Gottlieb will be dancing to scintillating tunes as part of an esteemed tribute to the one and only Asha Bhosle. So make sure that you catch ‘Timeless Asha’ on Zee Classic on Friday, 8th September at 7 PM.